Are you a new parent? A new grandparent? New to Oakland or just in town for the weekend? If you are looking for your next adventure and wondering where all the Oakland families are hanging out, look no further. 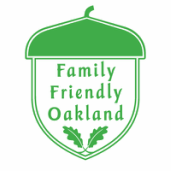 Have a look at the first-ever map of family friendly places in Oakland. This map includes places for families to explore, play, read, learn and shop. Also included are youth and family-serving organizations and even a few yummy places that people of all ages can enjoy. Have fun! ​There is no strict definition for what makes a family friendly dot on this map, but in general, these are places with a high number of strollers, school backpacks and multi-generational groups. Where parents, children, teens, aunts, uncles, cousins, grandparents and more hang out. This map is a start, but is surely incomplete. Please let us know if you have any corrections or want to suggest additions.